The main display consisted of the broken wing and propeller of a derelict plane festooned with colourful epiphytes - an eerie prediction of what will eventually happen to the wreck of the Kenya Airways Boeing 737-800 in the jungles of Cameroon, perhaps? Degarmoara Skywalker 'HQ Sport' is a multigeneric hybrid grown by Plantae Nursery and sported three inflorescences of truly huge, flat mulberry flowers - an intimidating sight for any orchid grower and truly deserving of its accolade. 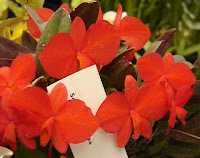 Reserve champion was this exceptionally well-flowered example of Sophronitis coccinea. Literally covered with flowers on all sides, this specimen reflected the patient nurturing of its owner. 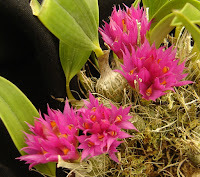 This striking miniature orchid is called Dendrobium petiolatum and received a Class Winner ribbon. 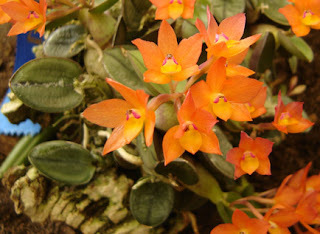 This was the first time I had ever seen this particular Dendrobium species - quite a thrill. Many displays showed a lot of creativity in design this year. 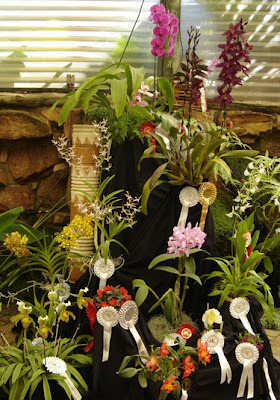 Blossoms from Vandas and hardcane Dendrobiums floated in three sensual saucers of water in one minimalist display; another employed Cymbidiums, hardcane Dendrobium cut flowers and giant bamboo in an enormous Zen display suggestive of Japanese ikebana. 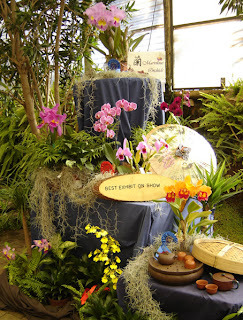 However, the award for best display went to this tiered display of Cattleya and Phalaenopsis hybrids from Marvilous Orchids [sic] complete with chinoiserie and Engrish name card. Rarely noticed, the back of an orchid flower also has a beauty all its own. The twisting grooved stalk of this pink Vanda is actually the ovary, which swells to form the seed pod once pollination has occurred. 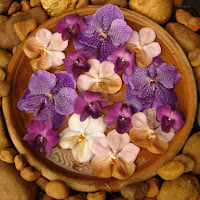 The twisting is responsible for resupination, a phenomenon that ensures that the lip of the orchid is always lowermost. 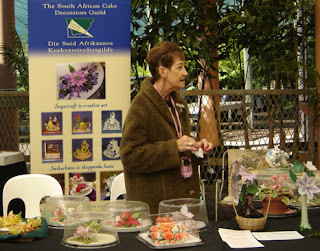 There was also a stand dedicated to the South African Cake Decorators Guild - curiously, I couldn't find any orchids among their many examples of floral sugarcraft. I thought the lady's coat and mobile phone pouch combination were quite arresting though, and simply had to include a picture of it here. 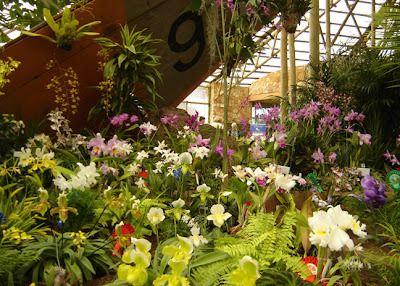 Back to the orchids. This was my absolute favourite thing on show. It is called Schomburgkia splendida and hails from Colombia and northwestern Ecuador. 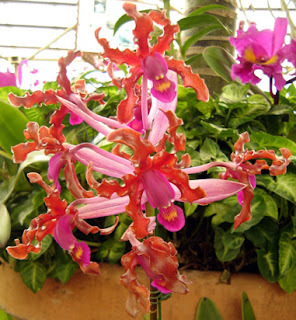 It has unique bright pink bracts at the bases of its ten centimetre waxy brown flowers. Yummy. I covet. I spotted these young orchidologists in the crowd. The one was even carrying a little notebook! 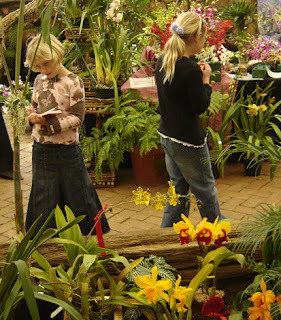 A lot of people are starting to come to the orchid shows as a family outing, with children enthusiastically pointing out curiosities of the vegetable kingdom to their mums and dads. This well grown Sophronitis cernua glowed like a jewel from its bark mount, garnering a 2nd prize ribbon from the judging panel. Lastly, I'd like to leave you with a special plant. 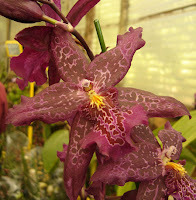 This is a primary hybrid, a cross between the two Brazilian species Laelia sincorana and Laelia lobata. 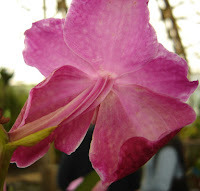 It had three large pink blossoms showing characteristics of both its parents. Apart from the ubiquitous Laelia anceps, this was the probably the only purebred Laelia on show this year. 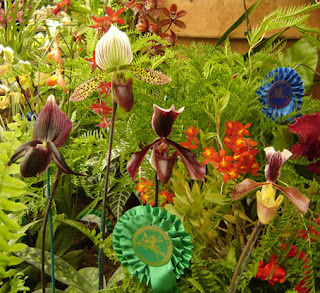 The judging panel thought it unusual and of sufficient quality to award it a red 1st prize ribbon. And who would the owner of this prize winning orchid be, you may ask? Why, that would be me. Outside my window the trees are moving. A cold front is bringing winter to the Highveld. Sunny afternoons and cold nights bring many people a sense of melancholy or ennui, but the changing seasons fill my days with whimsy and nostalgia. This might be because I'm moving soon: I feel like I need to take stock of my life, somehow. I've been thinking about my life as an undergrad genetics student during the first part of the 21st century. What fun; how naive I was about science in those first three years. After more than seven years of studying molecular biology, I feel like I've honed my learning, narrowed it down to key skills. I know I did physics and calculus in my first year at university - where did that knowledge go? Bernoulli's principle is a foreign concept again. Is my brain really that selective, choosing to archive only the facts that would prove useful in my future career? I was almost convinced that this was true, but then decided that it was not the case. Because what I remembered was this: vivid lectures in darkened rooms where professors shared with me the most incredible arcana of our natural world. These facts are not just bubblegum trivia: they are the keys to where we come from, where we are going, and how to get there. They are the truths that achieve what nothing else ever could, and why I chose to become a scientist in the first place: they fill me with a sense of awe. I would like to share some of these secrets with you, secrets discovered through the cumulative efforts of brilliant minds across the ages and continents. ∙ The complex structure of the eye has actually evolved independently in different lineages of organisms at least five times. ∙ The nuclear envelope is confluent with the endoplasmic reticulum and plasmamembrane, so that - in essence - the nucleus is controlling the cell from the outside. ∙ Since HIV enters T-cells by mimicking certain proteins of the immune system, any vaccine that acts by mimicking HIV to stimulate the immune system might actually induce AIDS without the presence of the virus. ∙ The photosynthetic protein ribulose-1,5-bisphosphate carboxylase is the most abundant enzyme on the planet, making up 15% of the total protein content of chloroplasts. ∙ The 3D spatial arrangement of chromatin inside the cell is of vital importance in gene regulation. This spatial orientation of DNA is severely altered in individuals suffering from epilepsy. ∙ Due to genetic imprinting, the copies of genes responsible for the growth of the placenta are activated only on chromosomes inherited from the father. This makes its growth more aggressive, as maternal genes wouldn't want to jeopardize her capacity for future conceptions. ∙ Certain people have a 32 base pair deletion in the gene for the CCR5 chemokine receptor. 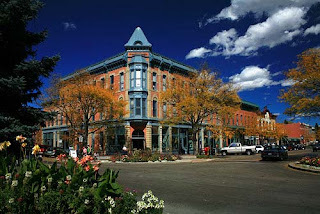 This is a known docking site for HIV and people with the deletion are resistant to infection. If we infected everybody everywhere in the whole world with HIV, we could achieve global immunity in one generation. Of course, only a fraction of us would actually survive. ∙ In reality, plants can only produce three kinds of structures: leaves, stems and roots. All other structures including thorns, tubers, flowers and fruit are formed through modification of those three primary structures. ∙ During continued carbon starvation, the body enters a state of ketosis, during which the heart and brain use acetone and related molecules for energy. ∙ The combined weight of all the viral particles floating in the world's oceans right now far surpasses the combined weight of all the whales swimming in it too. ∙ Nicotine is so toxic that the tobacco plant has to store it in special vacuoles. If you grind up the leaves of one tobacco plant and spray the resultant nicotine extract onto another tobacco plant, that plant will die. ∙ Fungi are not plants. Although they are classified into their own kingdom, fungi share many similarities with insects, not just in certain genetic signatures, but also in the ability to synthesize chitin. ∙ Most fertilization events end in spontaneous abortion due to genetic defects in the embryo. Usually the mother never even realizes that she was pregnant. Disclaimer: it is plain to see that I have not referenced anything in this post. Please do not cite it as a primary source of information. Always go back to the original published accounts. I am looking to the future but thinking of the past. That pretty much sums up my current state of mind. Come August I will leave South Africa for foreign climes. I will sleep under strange stars in a mountain town without the cries of hadedas. I will have trouble crossing the street, being so used to cars keeping on the left. I will experience snow. I will celebrate public holidays I didn't know existed and familiar ones in the wrong season. I will write complicated letters to family and friends. I will subsist on fast food. I will take long walks in the countryside. I will have an accent different to that of people I meet. 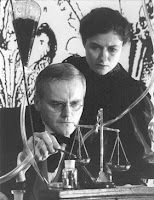 I will spend a lot of time in the lab. I will live frugally, so that I can afford to travel. I will go to concerts. I will refuse to drink beer using a funnel. I will watch ice hockey and baseball games. I will worry about my family. I will live on my own for the first time in my life. I will not lose my identity.